Straight from the Big Apple, Sadelle’s is famous for their bagels, sticky buns, fried chicken and Sadelle’s tower. 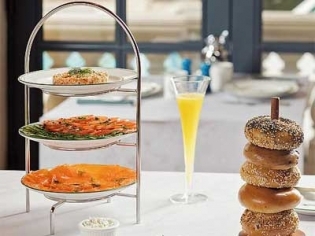 Breakfast is available all day with omelets, caviar, bagels and a large variety of fish. Lunch is available after 11 am, and features, soups, salads, sandwiches, and entrees like fried chicken, fish tacos and blackened ribeye. Do not pass up the pastry cart loaded with danishes, cookies, babka, donuts and much more. Serving hand-rolled bagels instead of a bread basket, don’t miss out on one of their famous towers which are loaded with every topping you might want for your freshly made bagel.